The Walt Disney Company has announced it will release the next Star Wars film on 18 December 2015. 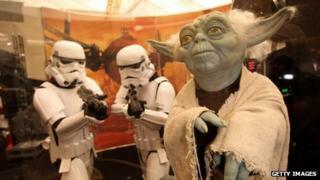 Disney bought Lucasfilm, the company behind Star Wars, from creator George Lucas last year for $4bn (£2.6bn). Disney announced the release date as it reported a better-than-expected 12% jump in net profit for the three months to 28 September. It made a net profit of $1.39bn during the quarter, up from $1.24bn during the same period last year. The company also reported that its net income for the financial year to 28 September jumped 8% from a year ago to $6.1bn. "We're extremely pleased with our results for Fiscal 2013, delivering record revenue, net income and earnings per share for the third year in a row," Robert Iger, chief executive of the firm, said in a statement. Disney's movie studio business saw a 7% jump in revenues during the fourth quarter. Revenues rose to $1.5bn during the period, helped mainly by the strong performance of Monsters University, which Disney said "partially offset" the weak showing of The Lone Ranger. However, operating income at Disney's cable network unit, which includes the ESPN sports channel, fell by 7% to $1.3bn in the last quarter, which the firm said was due to the timing of some ESPN affiliate fee revenues.